The fixtures are starting to pile up, and it's only getting worse with Boxing Day a few weeks away and another round of European matches a week from now. That means the injuries will continue and your captain may be unexpectedly rested. In fact, that just happened with Sergio Aguero and it could happen again with Raheem Sterling for the trip to Watford. But before Man City, there are two other favorable matchups with Spurs hosting Southampton and Liverpool at Burnley. Liverpool are surprisingly the bigger favorite even on the road and likely without Sadio Mane, which means Mohamed Salah will be a popular choice. He hasn't been at his best lately, with zero shots on goal in his last two in all competitions, but it's hard to pass up on anyone going against Burnley these days considering they just fell 2-0 to Crystal Palace and lost 2-1 against Newcastle in their last home match. Burnley have been bad over the last five gameweeks, conceding 114 shots and 88 chances created, both much more than any other club. Still, Salah is the only attacking player I trust on the Reds, with Trent Alexander-Arnold the next best captain option since he's on corners in addition to a clean sheet possibility. The odds don't say it, but Tottenham have equally as good a matchup against a Southampton side that gave up three goals to Fulham in their last road trip. Harry Kane hasn't stood out this season, but he still has eight goals and is getting multiple shots on target no matter the matchup. 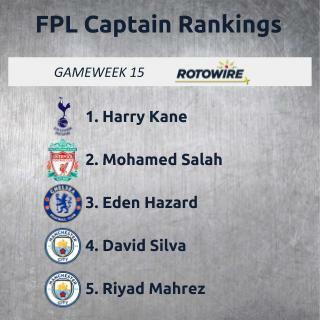 If you had to bet on one player that would score this gameweek, it'd be Kane. Christian Eriksen would be close behind, but he still hasn't started back-to-back matches since returning from injury and there's no telling if he will following the North London derby. He's been excellent, but without a guaranteed start, I can't back him for the armband. If Kieran Trippier is declared healthy before roster deadline, I'd throw him in the mix, as well. City are just as big of favorites mostly because Watford have fallen off with one point from their last four, including a 3-0 home loss to Liverpool. The issue is that the starting XI will be a question until the lineups are released. It's hard to see Sterling getting another start after going a full 90 in the last two, and Leroy Sane is in that same boat, albeit with less playing time. I'd put money on both Riyad Mahrez and David Silva returning, but again, it's unknown who they'll replace, with Bernardo Silva and Ilkay Gundogan also possibilities. Gabriel Jesus should get another start, but he's not on most teams and probably won't see 90 minutes even if Aguero again misses out completely. If you can, I'd give David Silva or Mahrez the armband, and if you don't believe in rest, Sterling is the likeliest to make the starting XI of the others. Both Silva and Mahrez have been excellent when in the squad, so it's not much of a drop off as it is. If news comes out about Aguero returning to the lineup, I'd put him above everyone else. Chelsea are a little harder to back on the road even with Wolves struggling. Wolverhampton haven't allowed a ton of opportunities, but almost half of the shots on target they've conceded have ended up in the back of the net. Eden Hazard should be good to go assuming he didn't pick up a random knock over the weekend. He's been one of the most consistent players in the league this season and is getting multiple shots and chances created per appearance. However, Everton and West Ham are actually bigger favorites than Chelsea, hosting Newcastle and Cardiff, respectively. Richarlison isn't getting enough opportunities for me to trust him, while Gylfi Sigurdsson is almost doubling his numbers from last season with 2.67 shots and 2.51 chances created per 90 minutes. Newcastle were playing well and then they fell 3-0 at home against West Ham. Chicharito turned into a real Premier League player again last weekend, but I'm not captaining him because of it. Marko Arnautovic still creates more for his teammates and is averaging more than three shots per 90 minutes. The Hammers have one of the better matchups, even if Cardiff have looked somewhat better. Their away numbers aren't good, but a lot of that can be blamed on the schedule, with their last four trips being at Chelsea, Tottenham, Liverpool and Everton. According to the matchup, Callum Wilson is the next best choice for the armband, already with an impressive seven goals and four assists. Huddersfield fell apart at home against Brighton and already gave up three away goals to the likes of Leicester and Watford. Wilson may be the best differential because Bournemouth have shown they can put up big numbers against weaker sides. I'm not as convinced about Aleksandar Mitrovic (v. Leicester) or Wilfried Zaha (at Brighton) in more difficult spots. And as usual, I'm avoiding the most unpredictable matchup of the gameweek with Man United hosting Arsenal. I think that could easily go opposite of the Tottenham-Arsenal game, as United play a bit more defensive.